Google released its Q4 ’10 earnings last week. I’ve taken the figures for the UK and converted them to pounds which gives some insight on Google’s performance here in Blighty. 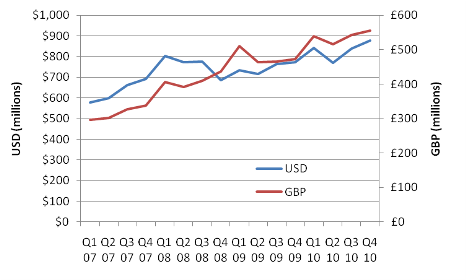 2010 showed a 13% growth on 2009, as Google recorded c.£2.15bn of revenue in the UK. 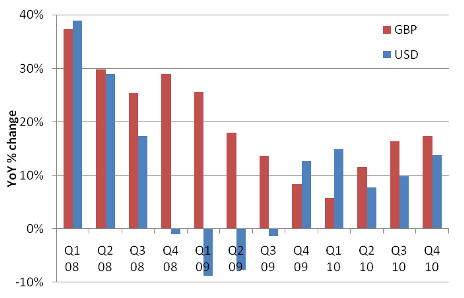 It’s a staggering amount – ITV will probably make £1.4bn in revenues from TV advertising in 2010 (based on their H1 results). 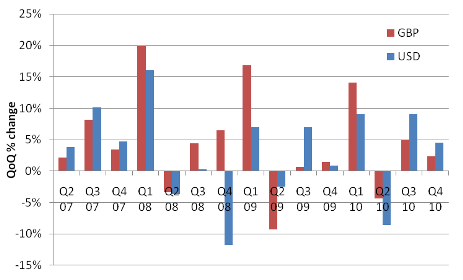 Here are the charts that give the quarter-on-quarter view since 2007.